John McKenna was born in Belfast and first qualified as a Barrister at Law. In addition to his legal work, John worked as a journalist in Dublin, writing particularly for Hot Press and In Dublin Magazine. In 1991 John and Sally McKenna began their research into Irish food, giving up their Dublin flat, and splurging on a broken-down Renault 4. They set off around Ireland to discover what they hoped would be an exciting food culture, and John has written about Irish food ever since. 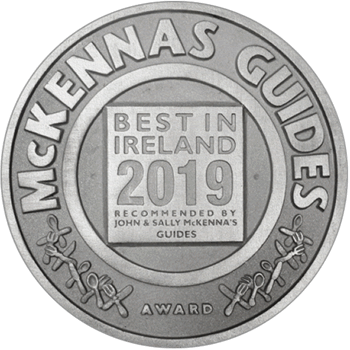 John McKenna has won numerous awards for his food writing, including a series of Glenfiddich Awards, the Andre Simon Special Award and the Slow Food Ireland Media Award. A long-time writer for the Irish Times, contributor to RTE television and news programmes, John also has written for various international publications, including The Art of Eating. He is regarded as a leading commentator on Irish food. Sally McKenna is a photographer, cookery editor, film-maker and the publisher of the McKennas' Guides, working from her office in West Cork. Eamon Barrett lives and works in County Waterford. He travels far and wide as a Bridgestone editor. Along with his wife Julie, Eamon has owned and run his own business, Altitude, in Waterford for the past sixteen years. Food has been a great passion of his during the last eighteen years and he been known to drive a round trip of over two hundred miles just to have lunch in a particular restaurant. Holidays involve a complex itinerary of how many restaurants of note are within driving distance. Eamon lives in Cheekpoint, Co.Waterford and his other interests include architecture, visual arts and music. Leslie Williams is a journalist, blogger and freelance Food and Wine Writer. He writes for a range of publications including the Evening Herald. Leslie lives in Dublin with his wife Caitriona and son Grellan. Joe McNamee originally trained and worked as a Graphic Designer before eventually moving into journalism, working full-time for the Irish Examiner and becoming Deputy Arts Editor for that paper. Today, he is the lead food writer for The Examiner as well as writing for other Irish national newspapers. His very first job was in a fast food restaurant but he transcended that experience and at various times through the years, has returned to professional cooking, with almost a decade of experience in a variety of establishments and ventures, including nearly two years as head chef in Cork's legendary Quay Co-op back when it ran a night time a la carte restaurant. In addition to contributing to the McKennas' Guides, he also consults with specialist food companies and restaurants. Aoife Cox is a blogger and journalist, best known for her The Daily Spud blog. Aoife has won the food and drink section of the Irish Blog Awards on two occasions, and her writing appears in the Irish Times and the Irish Edition of the Sunday Times. She is a Techie by training and lives and works in Dublin, but is proud to acknowledge her roots in County Kildare. William Barry's DNA would identify him as the son of Annie Barry of the legendary Annie's Restaurant in Ballydehob, and nephew of Tom Ferguson, patriarch of Schull's legendary Gubbeen Farm. Being reared in his Mum's restaurant didn't just give him a love of good food. It also instilled an appreciation of the restaurant business, an appreciation of what works with food, of what makes a place special, of what makes customers choose this place to eat, instead of that place. He studied commerce in UCC, graduating in 2010, which makes him still wet behind the ears, even when he isn't sailing. He has been a nightclub promoter and sales manager for a Dairy farm in Saudi Arabia. Journalist, broadcaster and Ballymaloe graduate Caroline Hennessy was one of the first Irish food bloggers, starting www.bibliocook.com in early 2005. Together with Kristin Jensen she set up the Irish Food Bloggers Association in 2010. She works in radio (presenting Foodtalk for Newstalk and contributing to lyric fm), print (Irish Times, Irish Examiner, Mail on Sunday) and online (RTÉ Publishing), is a member of the Irish Food Writers’ Guild and is devoted to exploring the intersecting worlds of Irish craft beer and fine Irish food.